My mother-in-law came to visit us the other day. When she comes, we often talk about food and find good ideas for the blog and for dinner. And so it was that day. We had actually planned something else, but suddenly she came up with the idea, that we should have Icli tavuk pilav – stuffed chicken with rice, pine nuts and raisins. And so it was. It is not something, I have tasted before. Not in Turkey, nor have my mother-in-law made this for me. But my husband was quite excited about the proposal, so he also said good for the project. I have made something similar before, just with bulgur, tomato, parsley, etc. (a little like this bulgur salad, just inside a chicken). It has never been quite as good as I have dreamed of. Either because the bulgur has become too hard, the chicken too full or something completely third. But I’ve never tried with rice. But this stuffed chicken was much better. The art is obviously to cook the rice almost finished in the pot and then stuff it in the chicken to get the last taste. 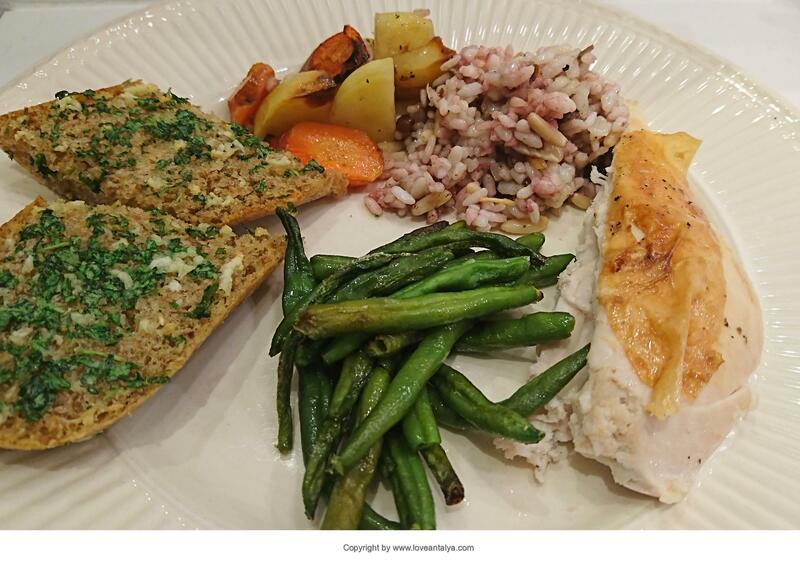 Both my husband and my mother-in-law talked eagerly about this dish, that they used to get in Turkey for New Year’s Eve – just with turkey instead of chicken. They changed it themselves to chicken, since no one in the family was special fan of turkey. Too bad, because I really like such a turkey, even if you have to be over it a lot, to avoid it getting dry. Well, it’s really pretty easy to make this one. However I would very much prefer, if one could just mix the rice with pine nuts, raisins and whatever else you think, and then put it in the chicken without having to cook it first. But this is just not the case (if you want a good result). We got crispy fried beans (beans with salt and olive oil and toasted crispy in the oven) and a little homemade garlic bread on the side. But a good salad with romaine salad or cabbage, grated carrots, chopped parsley, pomegranate kernels topped with a bit of olive oil and pomegranate syrup would not be so bad either. I have the best intention to make this salad and put up in the recipes some day. So I must do it in the nearest future. But back to the stuffed chicken. Many countries have a version of this dish. There is usually little changes to spices and the use of vegetables (more cinnamon and cardamom in North Africa / Morocco, turmeric in Pakistan and India, etc.). So there is almost free play – you can do as you please. I just made it plain Turkish with a little onion, slightly roasted pine nuts and raisins. If I had had the small dried raisin-like things, küş üzümü, I had clearly used them instead. They taste somewhat more powerful than ordinary raisins, and it will suit very well. But a little chopped parsley, tomatoes, (mild) sivri pepper, a little chili, garlic, a little white wine and possibly bulgur instead could also be really good, I think. Delicious Turkish chicken filled with rice, pine nuts and dried raisins. A really nice and easy dish that tastes really good. The preparation sounds a lot, but everything is actually something that suits itself. Nothing to cut and chop. 3: Fry the onion with butter and oil in a saucepan with middle heat, add the pine nuts and fry for about 5 minutes. 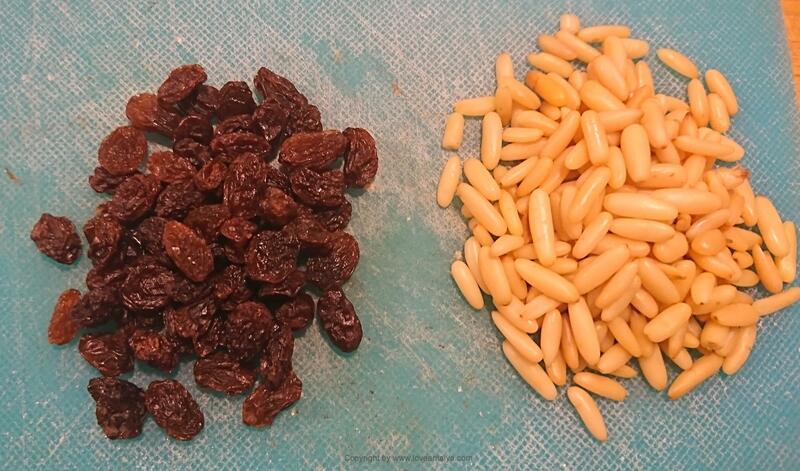 4: Rinse the rice, drain the water, and add it to the onion and pine nuts together with kuş üzümü. 5: Pour approx. 1 cup of water (maybe a little more), put lid on and boil at low heat for about 10-12 minutes. 6: Then fill the rice in the stomach of the chicken (you must not stuff it completely, because then there is no room for the rice to “raise” further). Close the chicken with meat needles or sew it if necessary. 7: Put a little oil on the chicken and put it in a 175 degree hot oven for just under 2 hours. Keep an eye on it so that it doesn’t get too much or too little. Drizzle the juice over now and then to avoid dryness. 8: Let it rest for 10 minutes. Cut it up, take the rice out and serve it on a plate together with garlic bread and a good salad if you want. If you like, you can cut 5-6 regular potatoes in pieces and 4 carrots or other vegetables and place them on the bottom of the pan and put the chicken on top. It tastes pretty good, when the vegetables are soaking in the chicken juice. I didn’t even put spices in, but a little cinnamon will suit the dish well, I think. Just a little bit. And otherwise slightly chopped parsley, dill, bay leaf or the like in the rice. If you have too much rice in excess or have made a little extra, then boil it in a pot next to it or pur some water in a bowl and put lid over and let it fry for the last hour, along with the chicken . It is important that you “close” the chicken carefully, so that the “vapors” stay in it and help the rice to rise. Brush if necessary. the chicken with melted butter mixed with a little lemon juice and chili sauce or with a little oil mixed with a little tomato paste. It gives just a little extra.